Dr. Jess Haymore is continuing the tradition of providing trusted, quality dental care set by his father Dr. John Haymore, who was the first dentist in Oro Valley more than 30 years ago. Dr. Haymore's practice is an extension of family and community. His patients receive the finest care dentistry has to offer. 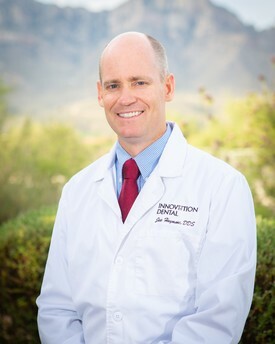 Dr. Haymore obtained his DDS degree from the University of Washington School of Dentistry in 2002, and has since established himself as a leading dental provider in Oro Valley. His extensive skills in the areas of restorative, cosmetic, and implant dentistry combined with his pleasant chairside manner and sense of humor makes him a favorite with patients of all ages. Dr. Jess and his wife Tania are both Arizona natives. They have five children who are active in sports, dance, music and many other activites! Dr. Jess is actively involved in the Oro Valley community and church-based services. He has participated in projects ranging from community service to organizing youth dances and manning aid-stations for El Tour de Tucson. An avid athlete himself, Dr. Jess enjoys playing soccer and participating in a variety of running and cycling events. 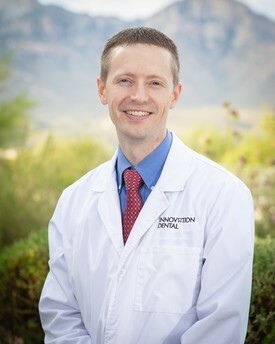 Innovation Dental welcomed the addition of Dr. Sam Peterson in July of 2018. His addition to the practice was a seamless transition proving he was the perfect fit for our dental team. Dr. Peterson graduated from Temple University's Kornberg School of Dentistry in 2013, and has used the years since gaining extensive experience in comprehensive general dentistry for the entire family. His years working at Fine Arts Dental Lab prior to dental school gave him an amazing artistic ability to perfect the balance of aesthetics and function. This allows him to provide his patients beautiful restorations that can last. His commitment to professional excellence is evident daily to our entire team and every patient he treats. He ensures each patient is welcomed with sincerity, feels heard, understands the ideal treatment he is recommending and any options he or she may have. Then, provides dental treatment with exacting dental precision. Dr. Peterson simply knows the difference truly caring makes. When he is not in the office, he and his beautiful wife and children enjoy their time together. The family is very involved in their church, and the children participate in many different sports and activities. As the youngest of eight, Dr. Peterson and his family always look forward to the fun times of memories made at family reunions every two years ... they are always on the go. If Dr. Peterson can find a spare minute, he also enjoys reading, cooking, and rock climbing. Dr. Peterson has quickly become integrated into our practice. His daily investment in open communication, patient devotion, and a dedication to provide only his best, demonstrates that his patients and team are an extension of his family. With sincerity and a commitment to precision defining his professional care, we could not be more honored that Dr. Peterson and his family have made Innovation Dental their home.